Here is email I received from Laurie Barwell (lbarwell@csir.co.za). I thought I should shared extracts of this with you, since it is the experience of another university. 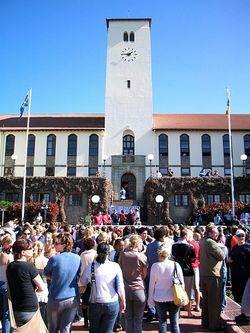 Rhodes (University) did a research project in 2005 to determine the level of plagiarism in past assignments and scanned a large number of past student papers and assignments. This was done as a baseline prior to instituting a web-based plagiarism detection system. They found that a high level of "plagiarism" as defined in their policy existed, but concluded that only a small number of these were done intentionally, in other words there were very few "villains". They concluded that the problem was that students "had a lack of command of academic literacy". They further concluded that it was the teachers and lecturers' responsibility to teach students how to write. Although Rhodes subsequently implemented a web-based scanning service to assist with the issue of plagiarism, they only use it as a "teaching tool" aimed at creating awareness and education. The results of the scans are made available to lecturers and any follow-up action left up to the discretion of the Lecturer. A distinction amongst, Plagiarism, Copyright infringement and academic dishonesty was drawn. Different actions are required for each. It was stated that, for example, a student could pay someone else (a ghost writer) to write a Masters Thesis (or an assignment) without committing plagiarism or a copyright infringement, but thereby be academically dishonest .. a serious "crime". Copying others' work was also not necessarily plagiarism, but can be a combination of copyright infringement and academic dishonesty. The question was posed whether lecturers don't perhaps promote dishonesty by providing copied books/notes/videos to students under the perception that they are helping the spread of knowledge ... this is stealing! A Xhosa-speaking lecturer made the comment that in some cases the students copied the statements from text because they felt their own ability to communicate the facts stated by the author was inadequate and that they could not improve the text ... they did not realise that they should have tried to convey their own understanding of the specificfacts, and not the facts per se. The key lies in teaching students the ethos of becoming knowledgeable through the interpretation of available information and forming an own opinion (= creating new knowledge). Personally, I believe UWC needs to know the extent of the plagiarism problem and this is done through direct questioning/interviews with students and by way of a service like Turnitin. As Rhodes has done, we need to confirm reasons behind committing plagiarism. Although a lecturer can elect for Turnitin to withhold providing originality reports from students, I personally believe that its value is more for the student than the lecturer. It may help instil more original thought, better integration between viewpoints, eventually leading to the students forming their own opinions. Academic empowerment is to engage in free thinking and the ability to express such thoughts to a wider audience. I do agree that most student, and were unaware of the issues and often feel they cannot express it better than the original author. Herein is the main issue as a lecturer, and that is we need to get students to review multiple information sources to form opinions and view points, I will illustrate this with the following example. Nothing is faster than the speed of light and this is a constant – Correct? In quantum theory and Heisenberg uncertainty relations photons can travel at any speed for short periods – in other words they appear to be able to be propagated elsewhere faster that the speed of light. In cosmology, a variable speed of light has been proposed by John Moffat, and subsequently by João Magueijo and Andreas Albrecht (the latter has subsequently distanced himself from this) to explain the near uniform cosmic microwave background (CMB) radiation in the universe. The CMB radiation comes from 15 billion light years away but we know that the light emitted occurred when the universe was younger (about 300,000 years old). This would mean that any two distant points in the universe should not have been influenced by one another and yet they have the same temperature? The explanations are either cosmic inflation where during the immediate period following the Big Bang that created the universe, it (the universe) increased at an enormous factor or in the past the Speed of Light was faster (calculated to be as much as 60 times). What I have demonstrated is even things we considered to be “truths” in physics are being questioned and alternative hypotheses sought. As scientists we need to review several references and compile this information, and explain it to ourselves first before we write it down for others to understand. When you copy and paste this process is essentially being short-circuited and you have not had the chance to internalise the concepts. Even though the previous authors may have expressed by summary the concept of a variable speed of light, I only really started to understand it when I put it into my own words for this posting. My own experience is providing that the Turnitin reports are given back to students, they are actually happy about submitting stuff for scanning. The Turnitin is more part of the learning to write process, rather than an academic policing. That's my say for the day. Wikipedia contributors. Variable speed of light [Internet]. Wikipedia, The Free Encyclopedia; 2006 Jun 25, 21:14 UTC [cited 2006 Jul 4]. Available from: http://en.wikipedia.org/w/index.php?title=Variable_speed_of_light&oldid=60544720. Wikipedia contributors. Rhodes University [Internet]. Wikipedia, The Free Encyclopedia; 2006 Jul 3, 22:24 UTC [cited 2006 Jul 5]. Available from: http://en.wikipedia.org/w/index.php?title=Rhodes_University&oldid=61921670. I have read the posting about plagiarism. I have read this posting. Thanx.